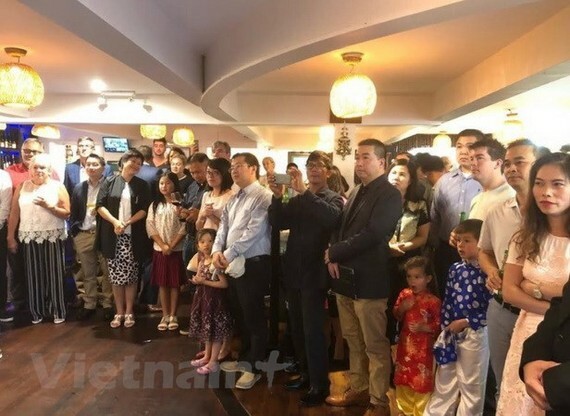 A gathering was recently held in Auckland by the Embassy of Vietnam for Vietnamese students and expats and foreign friends living in the country to together celebrate Tet, Vietnam’s traditional New Year festival. The event also marked the 88th founding anniversary of the Communist Party of Vietnam. Vietnamese Ambassador Nguyen Viet Dung extended his greetings and best wishes to all his guests on the occasion of Tet. He wished all Vietnamese people in New Zealand health, happiness and success so they can build a stronger community and preserve their traditional culture and mother language overseas. The ambassador hoped that Vietnamese expats will continue fostering people-to-people exchanges and ties between the two countries. The two countries inked the 2017-2020 Vietnam – New Zealand Action Programme on the sidelines of the APEC Economic Leaders’ Week in Da Nang last November to deepen bilateral relations and to upgrade their strategic partnership in the future, Dung said. Vietnam is New Zealand’s 16th largest trade partner with the two-way trade hitting about US$ 1.2 billion. The two nations aim to raise bilateral trade to US$ 1.7 billion by 2020, making economic cooperation a pillar of their relationship, he noted. The gathering took place at Asian Ruby, a Vietnamese cuisine restaurant, in Auckland, which is home to two-thirds of a total of 6,000 Vietnam people living in New Zealand.